Absurdist playwright Eugène Ionesco was born on November 26, 1909, in Slatina, Romania. The following year, he moved with his family to Paris where he lived until 1925, at which time his parents divorced and he returned to Romania with his father. In 1928, he began studying French literature at the University of Bucharest and two years later published his first article in the Zodiac review. A volume of poetry, Elegy of Miniscule Beings, followed in 1931, and in 1934 he published a collection of essays entitled No. In 1938, he received a fellowship from the Rumanian government to write a thesis on the subject of death in modern French poetry. He moved to Paris and began his research, but the German invasion (1940) soon forced him to relocate to Marseilles. He returned to Paris five years later, after its liberation from the Germans, and found work as a proofreader and translator. It was not until 1948 that Eugène Ionesco finally wrote his first play. Having decided at the age of 40 that he ought to learn English, Ionesco acquired an English primer and set to work, conscientiously copying whole sentences from the text for the purpose of memorizing them. Rereading them, he did not learn English as he had intended, but rather became aware of some astonishing truths—that, for example, there are seven days in the week, something he already knew; that the floor is down, the ceiling up, things he already knew as well, perhaps, but that he had never seriously thought about or had forgotten, and that seemed to him, suddenly, as stupefying as they were indisputably true. Ionesco set about translating his experience into a play, The Bald Soprano, which was staged on May 11, 1950, at the Théâtre des Noctambules, under the direction of Nicolas Bataille. Like many of the other “anti-plays” which would soon pour forth from Ionesco’s mind, The Bald Soprano rejected the logical plot, character development, and thought of traditional drama, instead creating a new anarchic brand of comedy meant to convey the meaninglessness of modern man’s existence in a universe ruled entirely by chance. Ionesco’s initial offering went unnoticed until (ironically, by chance) a few established writers and critics stumbled upon it and threw their combined literary weight behind the strange little play, throwing the spotlight on the now middle-aged Ionesco who soon found himself in a position of international renown. He followed this remarkable success with a string of critically acclaimed plays including The Lesson (1951), The Chairs (1952), and Jack or The Submission (1955). Ionesco’s comedies caused such a stir that, in the summer of 1958, dramatic critic Kenneth Tynan launched an attack against him in the pages of the London Observer, referring to the dramatist as the “messiah” of the enemies of realism in the theatre. The public debate which followed between Tynan and Ionesco over the value of anti-realism in the theatre forced the writer to elucidate his dramatic theories. He maintained that, contrary to Tynan’s assertions, he did not believe that communication through language was impossible. “The very fact of writing and presenting plays,” he wrote “is surely incompatible with such a view.” Instead, he insisted, his plays were an attempt to revitalize a dead form of communication, to renew the language by attempting to say new things in a new way. Some congratulated Ionesco on refuting the current theory of “social realism.” Others quipped that if he could put some of this “clarity and wisdom into his own plays, he might yet become a great playwright!” But regardless of which side of the argument they took, everyone was talking about it. On January 25, 1960, Rhinoceros premiered at the Odéon under the direction of Jean-Louis Barrault. Reflecting Ionesco’s personal experiences with Fascism, Rhinoceros depicts the struggle of one man to maintain his identity and integrity alone in a world where all others have succumbed to the “beauty” of brute force. It is considered by many to be Ionesco’s finest play. In 1962, in what would be one of the defining moments of his career, Ionesco was identified by Martin Esslin as one of the primary dramatists of what he called the “Theatre of the Absurd.” Esslin’s terminology resonated in a world still numbed by the senseless violence of World War II, and the label would affix itself to Ionesco until his death, forever joining him in the mind of the public with other “absurdist” writers such as Samuel Beckett, Jean Genet, Arthur Adamov, and Harold Pinter. 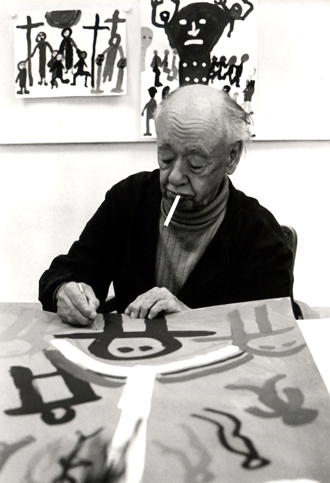 Eugène Ionesco died on March 29, 1994, at the age of 84, and is buried in the Cimetière du Montparnasse, in Paris, France. His other plays include The Killer (1959), Exit the King (1962), Hunger and Thirst (1966), Macbett (1972), and Journeys Among the Dead (1981).